In Las Vegas, you'll experience a Christmas unlike any you'll have back home. You can do some high-end shopping, go ice skating, and sample chocolates while you enjoy cacti full of Christmas lights. You'll see more Christmas trees than you can photograph, and you will be free to explore some new holiday traditions. Spend the holidays in Las Vegas, and you just might find you'll have so much fun that you'll plan to return next year. It may be the desert, but December in Las Vegas does bring cooler weather (but don't expect a white Christmas—snow never really arrives). Don't be surprised if your Christmas in Las Vegas is blessed with sunshine and 70-degree weather. Even though you won't need your heavy winter coat on the Las Vegas strip, you will want a sweater or jacket for cooler evenings. Since the weather is mild, there's plenty to do both inside and outdoors. Christmas shopping in Las Vegas is outstanding. You have all the malls and the great outlet centers. The Forum Shops at Caesars as well as the Shoppes in the Grand Canals of the Venetian and the Fashion Show Mall are bound to have what you are looking for (and what you didn't know you were looking for). You may be surprised to hear that there are six certified Rolex dealers on the Strip alone and that you can buy a Ferrari or Maserati direct from the showroom at the Wynn. If your taste runs more to the average, Las Vegas has two Premium Outlet Malls (north and south) where you can find some really nice things at outlet prices. Most of the shops in casinos on the Strip are open Christmas Eve. Most shopping centers close for Christmas Eve. Caesars Palace is usually a nice place to take a stroll, but around Christmas time, the lights and the trees really give you that special holiday feeling. You'll find artificial trees, artificial snow, artificial ice, and reindeer. Las Vegas is all about the make-believe. At Paris Las Vegas, the "City of Lights" transforms into the city of Christmas lights. 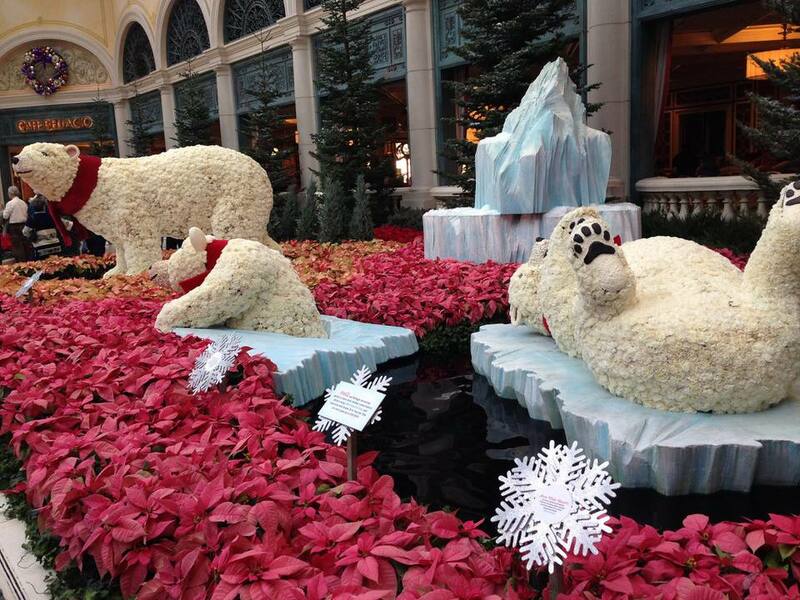 Wynn Las Vegas also transforms into a "Winter Wonderland" during the holiday season. Bellagio's Conservatory and Botanical Gardens provides an unforgettable holiday experience and it's free. Following Thanksgiving weekend, the gardens are transformed for the Christmas season. Bellagio’s holiday display is one of extraordinary beauty and creativity. There may be trains running through the display and animals perched in trees. The holiday display is available 24 hours a day, seven days a week from December 1 through January 6. Ice Skating with a View of the Strip: Put on ice skates at the Cosmopolitan Hotel and glide around while holding someone's hand and sipping a drink. At the Cosmopolitan Ice Rink, you can skate across 4,200 square feet of real ice, roast s’mores by the fire, and indulge in seasonal food and beverage offerings. The Cosmopolitan Hotel Ice Rink is set up in the Boulevard Pool area, and you’ll be in for a treat when the sun goes down, and the lights of Las Vegas place a glow on the surrounding landscape. Beginning November 21, the hotel creates a magical, park-like atmosphere. Sample Chocolates and See the Holiday Cactus: At Ethel M's, the cacti in the garden will be lighted and decorated for the holidays at the Ethel M Chocolate Factory. Ethel M welcomes visitors to see their three acres of cacti covered in a million holiday lights. During the season they offer live entertainment and hot chocolate. The lighting ceremony this year is Tuesday, November 6, 2018, from 5 p.m. to 7 p.m. Penn and Teller will be there, and the lights and gift shop will be open until 10 p.m. Admission is free with a toy, food, or monetary donation to charity. From all you can eat buffets with turkey and dressing to elegant multi-course Christmas Eve or Christmas Day dinners, you're bound to find holiday dining in plentiful supply. Some of the more famous restaurants will require reservations months in advance. STK at The Cosmopolitan will be open noon to 9:00 p.m. The will serve their full menu and an 18-ounce Prime Rib Special priced at $95. At Jardine - Encore at Wynn, a special prix fixe Chef's Tasting Menu will be available in addition to the complete a la carte menu. And The House of Blues Restaurant and Bar offers a Christmas Day special from 11:30 a.m. to 11:00 p.m. In addition to their House of Blues Menu, they are also offering a four-course Christmas-inspired feast for $45 per person (tax and gratuity extra).